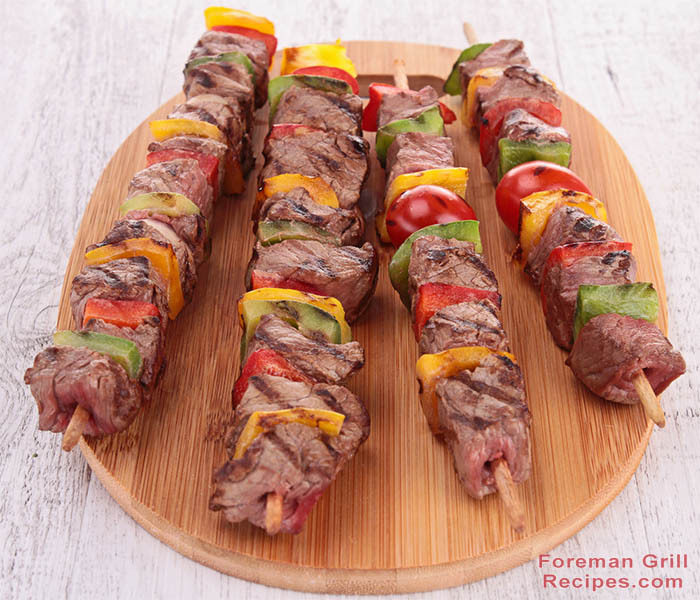 Here’s a recipe for beef steak kebabs that you can make right on your George Foreman Grill. It uses simple and easy to find ingredients and is a breeze to prepare and grill. You can prepare all the ingredients and grill the kebabs right away, but if you have time to prepare the night before, the marinade will really have time to set in and make the flavor truly explode! Sirloin steak is the best cut to use. It has just the right amount of marbling to give the steak chunks a nice juicy flavor while being tender and delicious. Cut up both yellow and green peppers into squares of approximately 1 inch. Cut steak into 1 inch cubes. Set aside. In a shallow baking dish, mix olive oil, soy sauce, vinegar, Worcestershire and garlic. Whisk for a minute so everything is well combined. Take all the kebab ingredients and start loading up the skewers. Start with a piece of steak, then cherry tomato, green pepper, steak, yellow pepper, etc. Place loaded up skewers in dish with marinade. Let it sit covered in the refrigerator overnight if possible. When ready to grill, preheat your George Foreman Grill for at least 5 minutes with the lid closed. Use high setting if you have it. Place kebabs on grill and sprinkle with kosher salt. Close lid. Let grill for about 3 minutes, depending on your grill. Give them a half turn and sprinkle with more kosher salt. Continue to grill another 2-3 minutes. Serve nice and warm right off the grill. Goes great over rice! My favorite recipe. The marinade gives it a mix of smoky and slightly Asian flavors. Great recipe. Just tried tonight and was easy and fantastic. I am so glad that you have a site with recipes that are easy to make and take very little time to make. My husband (the grill master) passed away in May and I have a fear of the gas grill.Even though I am just learning on the GF, i think it’s great.